Mobile projectors, I will admit, did not really take off as fast or as far as I thought it would have when it was first introduced to the world. It seemed that the poor battery life as well as relatively low resolution count proved to be its Achilles Heel, but that has not stopped manufacturers from giving it a go again and again. 3M is one of the pioneers in the field of mobile projectors, and this time around, they have decided to keep us entertained with the £299.99 3M CP45 Pocket Camcorder Projector. 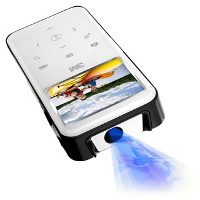 What makes this particular gizmo so special is the fact that this is not only a mobile projector, but a camcorder as well, so you can always record whatever you want on the go, and then play it back for your family and friends to see without the need to hook it up to a different device. Hmmm, sounds suspiciously familiar like one of those Nikon shooters. Hardware specifications include the ability to record in HD video, shoot 5-megapixel stills with 4x digital zoom, carry a 2.4″ LCD display, have 2GB of internal memory, and can project anywhere from 6″ to 65″ images. Battery life in projection mode is estimated to be up to 100 minutes, and it can record video for up to 150 minutes on a full charge. Sounds like fun, you might want to place a pre-order for it today.